Welcome to the annual Arts and Crafts selling exhibition . This year has again brought lots of unique, rare and great pieces all of which have been sought for this prestigious show at Liberty. The exhibition will run from Thursday 29th May (10am start) through till the 15th June, on the 4th floor central atrium. The show will include pieces by William Morris, Voysey, Baillie Scott and many more great designers from the Arts and Crafts period. There will be a collection of Rowley Gallery pictures 19 in total. Rare and important textiles including a pair of panels designed by Selwyn Image worked by the Royal School of needlework, furniture including a ‘Century’ settee by Morris & Co covered in original ‘Strawberry Thief’ fabric , metalwork by John Pearson, ceramics by C.F.A. Voysey and glass pieces including a spectacular stained glass panel by Scottish glass artist Stephen Adam . The catalogue does not give items' dimensions, so, for these or any other enquiries, please use the contact form (see link above), or email, quoting the reference number. I will be at Liberty’s for the duration of the show, but if you want to talk to me about any pieces please contact me on my mobile 07939 226 143. I hope you enjoy the exhibition and I thank you for your continued custom. Arts and Crafts copper casket decorated with birds and stylized flower decoration. Arts and Crafts copper rose bowl with stylized fish amongst weed. 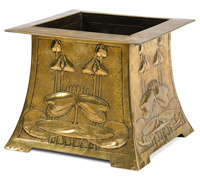 Glasgow School brass planter with moth and stylized rose decoration. Arts and Crafts copper box with enamel roundel decoration. 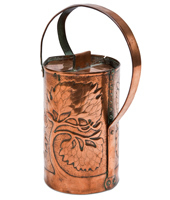 Arts and Crafts copper box with central enamel and seeded pod decoration. 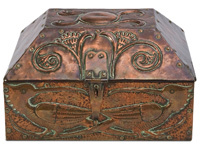 Arts and Crafts large casket in copper with stylised birds and flower decoration. 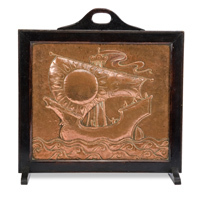 Arts and Crafts fire screen with copper panel depicting a galleon in full sail. Arts and Crafts copper charger depicting sailing boats in waves with 5 circular Ruskin pottery inserts. 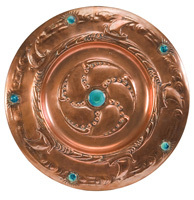 Arts and Crafts patinated copper charger depicting fish swimming with a central galleon . 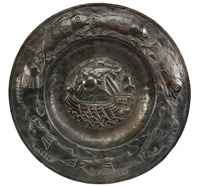 Arts and Crafts copper charger with stylised flower decoration around a central galleon amongst waves with dolphins. 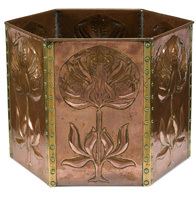 Arts and Crafts hexagonal copper and brass planter with stylised plant decoration and riveted edges. 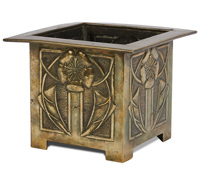 Arts and Crafts planter in brass with stylised plant form decoration. 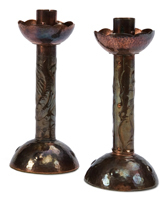 Arts and Crafts patinated copper over-mantle, with stylised seeded pod flowers and slag glass inserts.